Hair loss is a common problem among people and nobody wants to go through a phase where he/she starts losing hair. In present times, everyone is craving for getting a body which is in good shape and can increases the charm of his whole persona among his colleagues, families and friends. Not only a good physique gives a person better chances to raise his self confidence but also improves his self esteem. After shaving or tweezing, sometimes the hairs can grow back into the skin leading to inflammation and irritation. This is known as an ingrown hair. Just about everyone in their lifetime will develop their fair share of ingrown hairs. 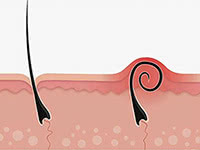 In general, teens and adults are more inclined to ingrown hairs. You’ve probably heard about how lots of European women don’t give a fig about underarm hair or hair on their legs. But many other women are not as accepting of body hair as their European counterparts.